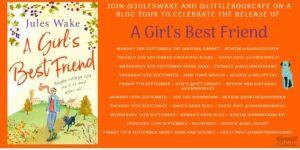 Welcome to my stop on the blog tour for A Girl’s Best Friend by Jules Wake. I’m so pleased to have a guest post by Jules to share with you today and would like to thank Millie Seaward from Little, Brown for asking me to be a part of the tour. Hello everyone and thank you for having me here. 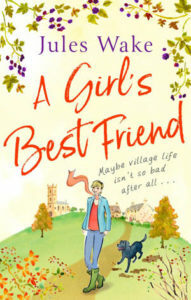 A Girl’s Best Friend is my tenth book and one that is very close to my heart because it’s the first one I’ve set in my local area. I’m lucky enough to live in a small market town in the Chilterns, the rolling hills of which I’ve come to love. I grew up in Yorkshire, so when I first moved here, I missed what I thought of as the ‘proper’ hills of the Dales, but over the years I’ve really come to appreciate the landscape of the beautiful area in which I live. Writing this book gave me an opportunity to pick some of my favourite places and now I look back I can see that I used those settings for some of the pivotal scenes. Wendover Woods, which is just over the border in Buckinghamshire, is where we first meet my heroine Ella and learn the depth of her misery at being exiled to the country. The damp, drizzly woods with the smell of musty old leaves feels totally alien to her and illustrates just how unhappy she is. However despite her antipathy I highly recommend it for a good Sunday walk! One of my favourite and another important scene was set on the edge of Wilstone Reservoir, featuring a runaway dog, illicit fishing and artistic inspiration, but to find out more you’ll have to read the book. It was great fun writing this book and I realised as I was writing about these places that I don’t spend enough time getting out and exploring my local area. My autumn’s resolution is to get out and find some new hidden treasures and find some new favourites but in the meantime I hope you’ll enjoy exploring the Chiltern Hills with my characters. Thank you, Jules. All of these places sound absolutely lovely and I hope you find the time to visit them some more.